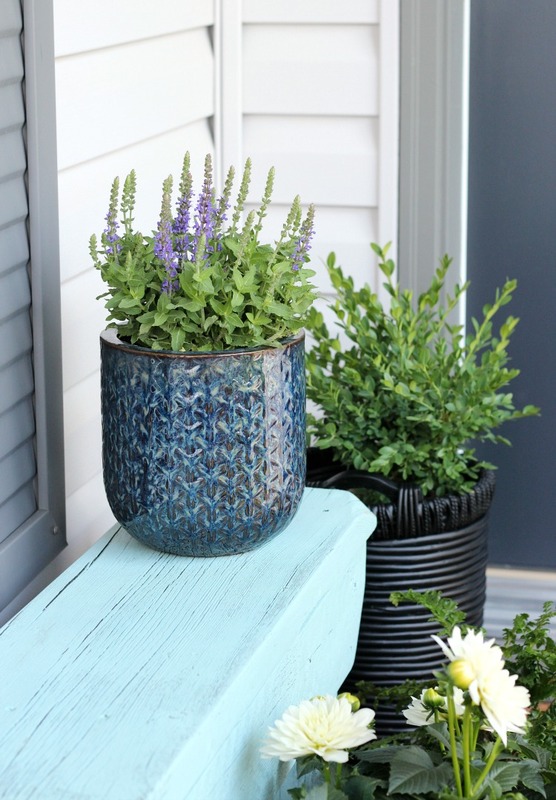 See how easy it was to transform a flea market find into a basket planter for our front porch. 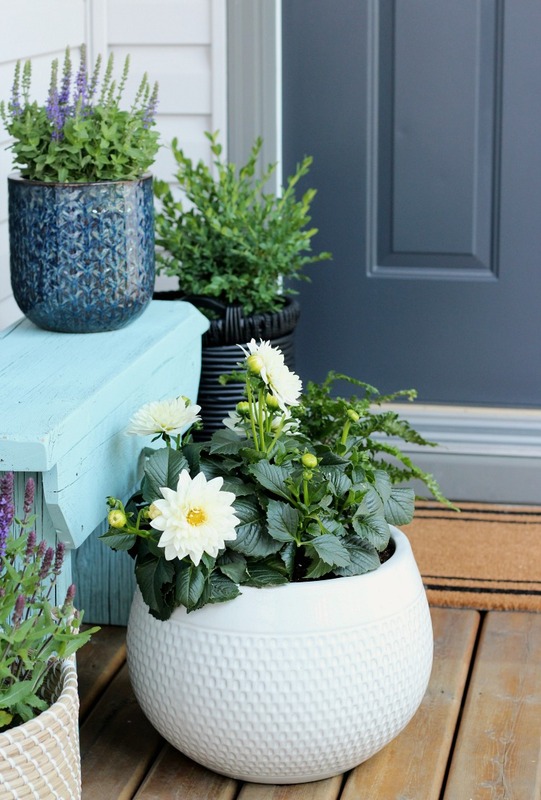 Plus, get inspired by even more outdoor paint and build-it projects. I can’t believe it’s the final week of the Outdoor Extravaganza already! Have you been following along? Be sure to check out my DIY succulent centerpiece and ice cream float bar to get caught up on anything you’ve missed in this fun series. The original plan for today was to reveal our totally freshened up front porch. However, a late start to spring, plus the air being filled with tree fuzz and petals at the moment meant we had to hold off on staining for now. It’s simply too much work to have it ruined. Our chokecherry tree is one of the culprits. So beautiful in May, but when the wind picks up, those blooms cover EVERYTHING! In the meantime, I decided to go ahead with some potted plants and new outdoor decor. I was getting antsy. 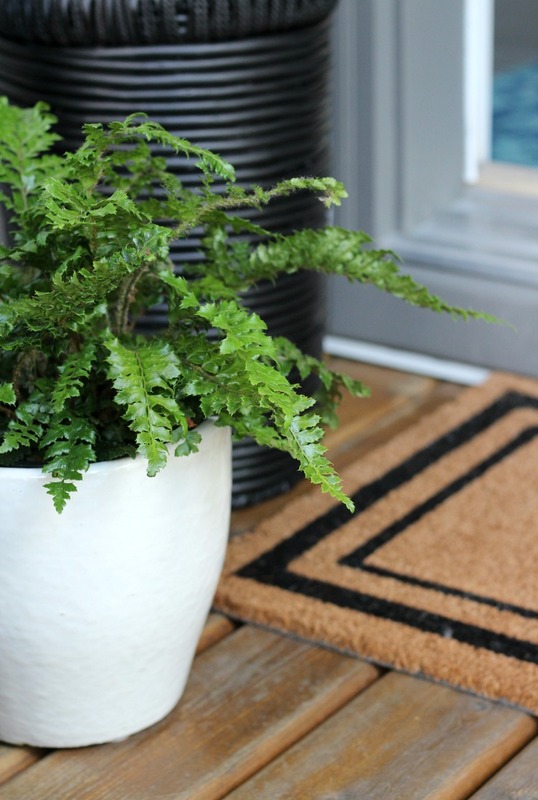 Our door is situated at the side of our front porch, which makes decorating the space a little challenging. 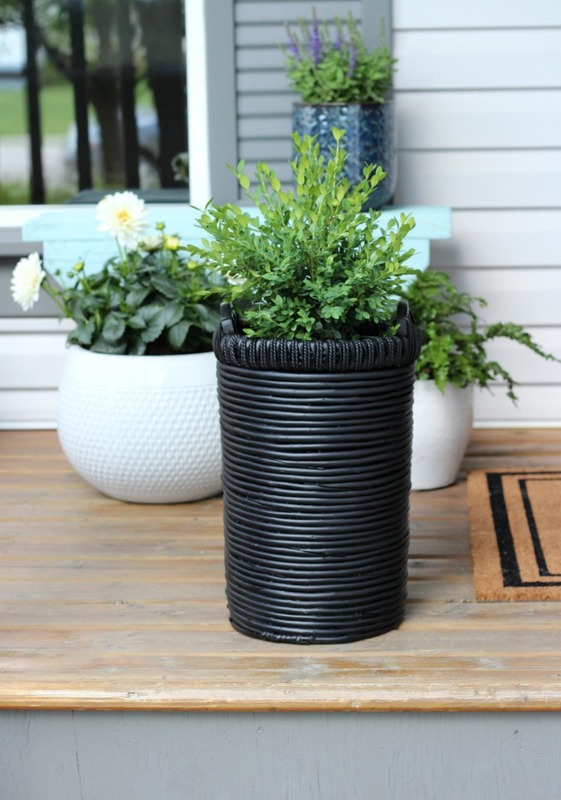 A tall planter works best, but it can’t be too wide or it blocks the doorway. While shopping at a local flea market last weekend, I spotted this tall basket and was pretty sure it would work as a planter. The colour was a little too orange for my liking, but a little spray paint fixed the problem in a hurry. Spray painting a wicker basket is easy. Just make sure it’s clean before you start. I vacuumed mine and wiped it down with a lint-free cloth. Then, I applied two light coats of semi-flat black spray paint outside. It’s best to do it when there’s little to no breeze. I placed an old sheet under the basket since there’s always over-spray. Our front porch is covered, so the basket will see very little rain, if any. I suggest keeping wicker as dry as possible even if it’s coated in outdoor paint. For the plant, I wanted something that’s hardy and low-maintenance since it’s right by the door where there’s tons of traffic. Boxwood will last right up until fall (or longer). I also like the punch of green it brings to that corner. A little trimming and light watering is all that is needed throughout summer. 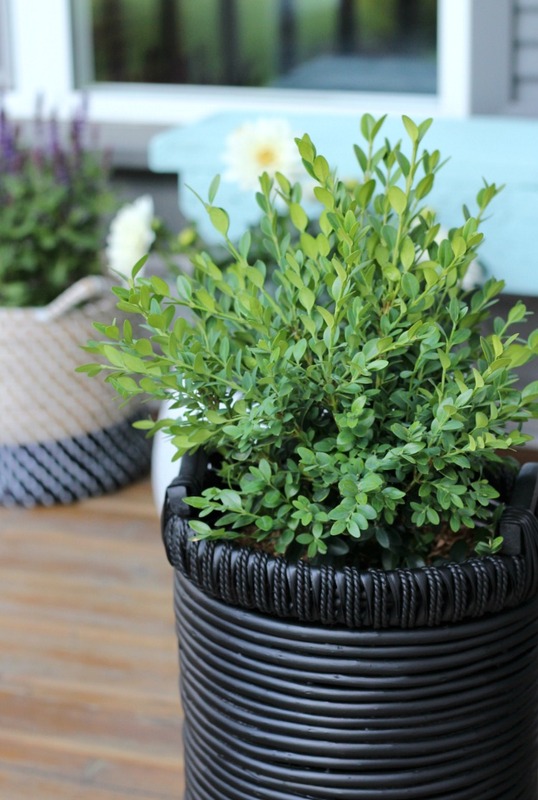 I kept the boxwood in its original pot, so I didn’t need to line the basket with plastic. I tipped another pot upside down and placed it inside as filler for the bottom. A tall plastic pot would work well, too. I’m going to keep my eyes open for one of those. Certain parts of our front porch see a lot of sun, so I chose “full sun” plants, including dahlia and salvia. 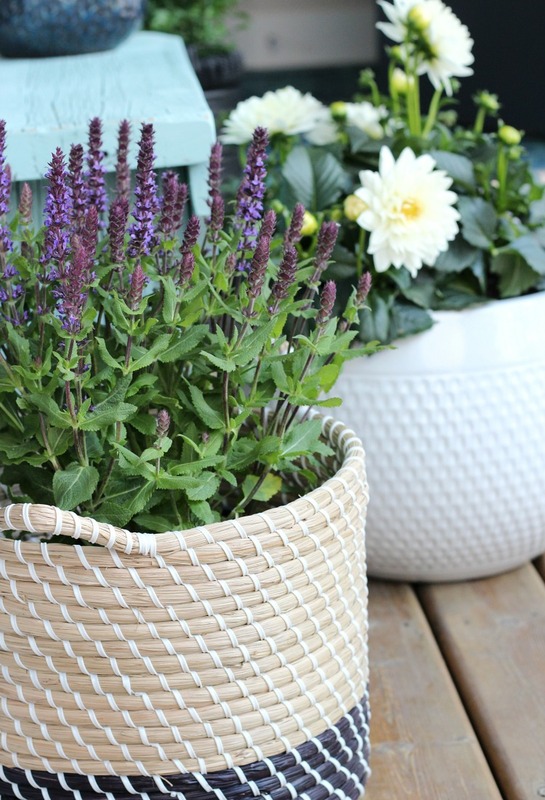 I picked up the woven basket and white pots at HomeSense last spring. 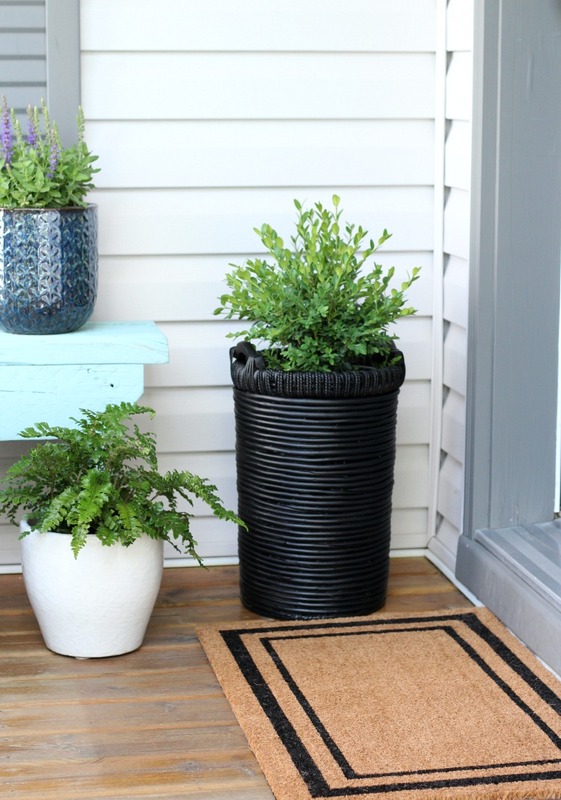 I like how they add a hit of freshness to the porch, and the black ties in well with the basket planter. Eventually, I’ll move the fern to the shaded side since it can’t handle much sun. 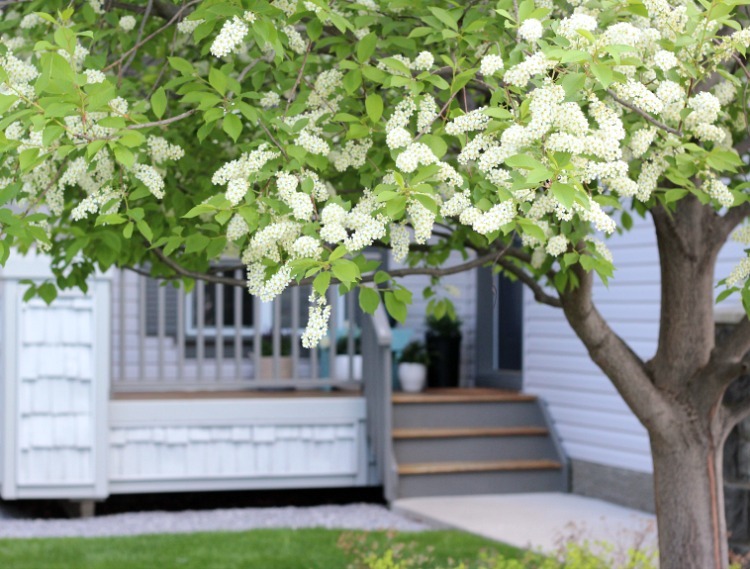 You’re going to love these creative outdoor ideas from this year’s participants. Be sure to stop by and say HELLO! Wow Shauna, I would have never guessed that was the same basket, it’s so classy and classic now, beautiful! Our whole porch is getting a reno – hopefully this fall, I know exactly what you mean by that antsy feeling. Thanks again for hosting such a fun series, I had a blast and now I’m ready for summer! This is such a great idea, Shauna! Your front porch looks beautiful. Thanks for organizing such a great series again! 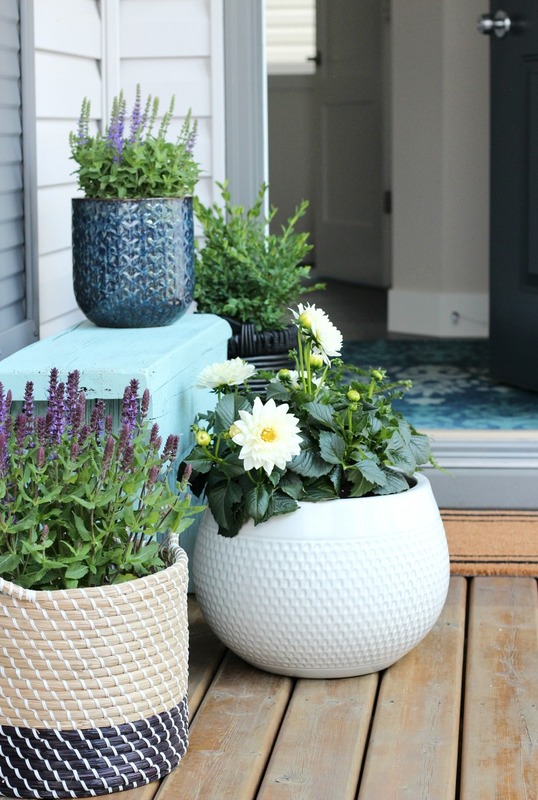 Your porch looks gorgeous Shauna! 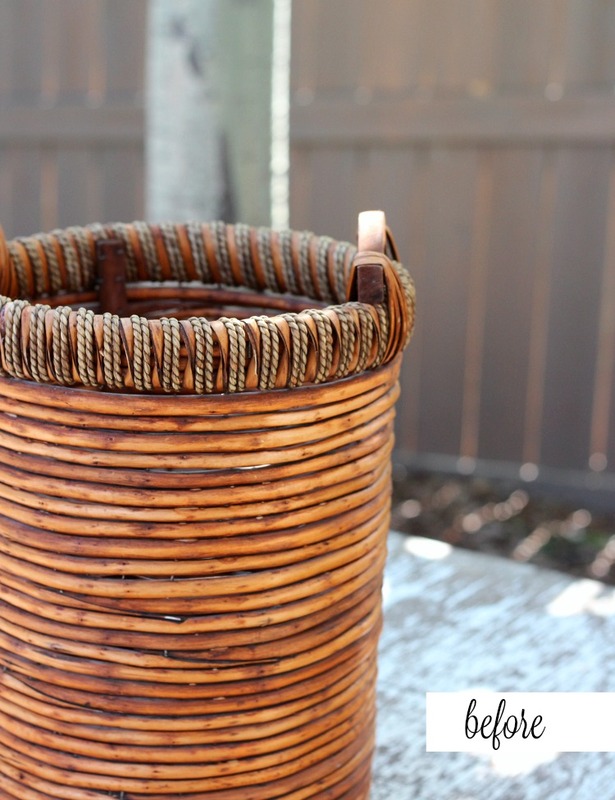 What a great idea to paint thrifted baskets for planters! I too wanted to refresh our front porch but the weather just didn’t co-operate, but this weekend should be perfect! I think I also need to go find some baskets to paint…I love this idea so much. Such a great idea to paint them! Our front stoop gets too much exposure, otherwise I’d love to use baskets like this. Thanks for hosting! What a great idea! I love all of the different colors/textures of the baskets together. I have the same Homesense one! Thank-you so much for hosting – it was a great boost to getting our outdoor spaces ready for summer! 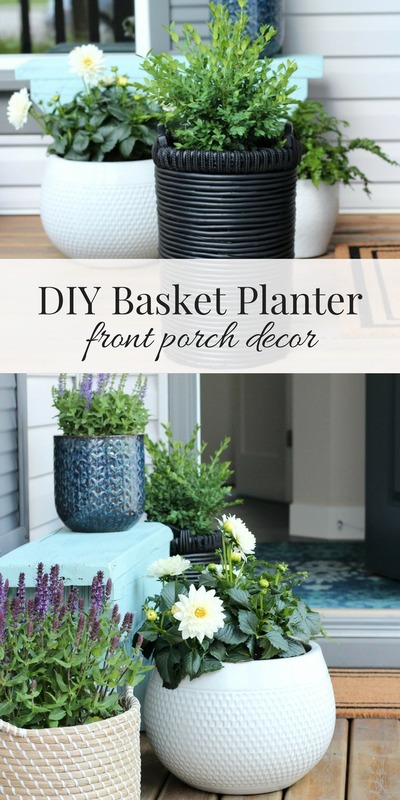 What a great idea to paint thrifted baskets for planters! Shauna, I feel your pain with Mother Nature this year. Today, again, it’s much colder than usually. Oh, well. Your baskets all look amazing and I love how sleek the woven one looks spray painted. So pretty! Oh my goodness, what a great makeover! I love how crisp and dramatic it looks painted black. I would never have thought to do that – brilliant! Thanks so much for hosting this fabulous series again, Shauna!